Like reading the telephone book; also, who was (dying or) reading what and when. It's not like I'll spend hours doing this, but it is somewhat fun to look over historical lists of names. For example, see the following from the ספר גל אבנים כולל המצבות בעיר טריאסטי by Aaron Luzzatto, 1851. The sixth name from the top appears to be "Hymie Heiman Ha-kohen," which is a great name indeed. Unfortunately Hymie was only a young girl, a sobering thing one takes notice of in cemeteries. Another fertile field are subscription lists in books. For example, the 1866-7 edition of the Karaite commentary the Keter Torah by Aharon ben Aliyahu contains a subscription list with some interesting names and titles (anyone want to take a crack at what הזוג"פ stands for?). Here you can see some of the subscribers to Iggerot Shadal. As you can see, the Chief Rabbi at London is on this list, as is R. Azriel Hildesheimer, and other notables. No, R. S.R. Hirsch did not pre-subscribe to a copy (although a letter to him is in the second volume). It's great how you'll see someone listed as R' Wolf. You know, from Hildesheim. Not even "R' Wolf Hildesheim" or "Hildesheimer," just "R' Wolf." Or look at Fürth. Everyone must know who R' Ya'akov is in Fürth! There's only one Elchanan. And so forth. In this same volume you've got what was to me at first, a mysterious ר' אלי' הירש סאלעווייציק. I wasn't thinking he was the Beis Halevi's uncle, but I also wasn't thinking he wasn't. Not being a Soloveitchikian genealogist, I immediately saw that Google did not laugh when I typed in "tzvi soloveitchik". Indeed, "Eliyahu Tzvi Soloveitchik" popped up as a definite combination which seems to have survived to the present. When I removed the "t" I hit gold, and saw that he was a grandson of R. Chaim Volozhiner, and is indeed the Beis Halevi's uncle. Marc Shapiro posted about him here, and he also included a photograph of him (which I borrowed from Avakesh. Doctor Luzzatto's British Pills for Bilious Complaints. The ad appeared for several weeks in the London Courier and Evening Gazette November and December of 1794. Unless his name was actually Ephraim Mordechai, then I'm not sure why his name is Angelo. Among Italian Jews "Angelo" was, and hopefully is, used for the Hebrew name "Mordechai," the same way "Zalman" is for "Shlomo." This naming convention is presumably based on Megillah 15a -- אמר רב נחמן מלאכי זה מרדכי ולמה נקרא שמו מלאכי שהיה משנה למלך. Please see my prior post, A shocking doctor's prescription written by Ephraim Luzzatto. The most important Hebrew words you'll ever learn? How a recent Hirhurim ("Hereurim") post reminded me of Francois Masclef's method of reading Hebrew without nekkudot. Masclef (1662-1728), by the way, was a foremost proponent of the "Hebrew without points" movement of the late 17th-18th century. He devised a method for reading Hebrew without nekkudot that sounds quite wacky (and is; but is also not as wacky as you'd think). Basically, his problem was twofold. One, he personally had a very difficult time learning to read and understand Hebrew. It's not hard to learn 22 consonants, but add dots and dashes and you get all kinds of confusion, unless you are 3 years old. The second is that fact that in innumerable instances the ancient versions (Septuagint, Targums, Origen, New Testament quotations, etc.) flat out disagree with the Hebrew of the masoretic text. This could be seen not only in words, but also in proper names, where the question is merely one of pronunciation and not meaning. Thus disagreement with the Hebrew means really that there is disagreement with the points. Quite often if you just take out the points and revowel the consonants in the Hebrew, there is full agreement with one or more of the versions. Feeling certain that the vowels points are only a commentary on the Bible, and a late and non-Christian one at that, he felt that there is absolutely no reason to pay any heed to them at all. This left the problem of how, practically speaking, to pronounce the Hebrew. He felt that it really didn't matter one way or another. By analogy, we also don't have a completely accurate, faithful to the ancient, pronunciation of Greek or Latin, but what does it matter? We understand those languages anyway. Still, reading Hebrew is a practical matter, so he came up with the following system: 1) place a vowel in between any two consonants, 2) treat אהו and י as the consonants a, e, o and i, 3) lacking those vowel letters, supply the sound of the vowel between consonants, so it should follow the sound of the vowel in the name of the Hebrew consonant. Thus, take a random Hebrew word like שמש shemesh, or the sun. Since ש is pronounced shin, מ is mem, and the final ש has no consonant after it, the word may as well be pronounced shimesh. Or the word שלום; shin is i, lamed is ah, ו is u, and mem has nothing after it, so it yields shilaum (instead of shalom). A quirk of the system is that when שלום is spelled defective as שלם, then instead of shilaum you'd read shilam. By the way, in case you were already scoffing at his relying on the traditional, basically masoretic pronunciation of the names of the consonants, a tradition passed on by the Masoretes, this didn't matter to him. In fact, he designates his system the "Artificial Prounciation," which makes sense since his point was only to have a practical way to read Hebrew in a consistent way, while rejecting the points. The point was to have a practical, not historically true, pronunciation. His contention was that the masoretic pronunciation was not historically true, meaning ancient, either. In addition, he actually rejected the masoretic pronunciation of the consonants. While retaining most of them, being they are never contested anyway (d for ד, etc.) he absolutely rejected the concept of the כפולים as being entirely groundless. Thus, for him ב is always b, פ is always ph, ת is always th, and is ש always sh (or ss). In defense of this, he cited the ancient versions which he believed justified this as much as any other way of pronouncing them. Masclef found that using this system he was able to read Hebrew comfortably in 15 minutes! This, in contrast to the years required to learn to read with points. What about the meaning of the words? In most cases it was not in question, no matter how it is voweled. Where there was a question, he felt that was a cue to consult the witnesses of the versions, which anyway was a normal feature of biblical scholarship. The advantage of his system, he believed, was that it did away with the difficulty of learning to read with nekkudos, and it also forcefully expelled the intrusive authority of the Masoretes! Finally, he felt the proper approach to Hebrew grammar was to follow the grammar books, but simply ignore the sections on points! Interestingly, in his review of Hebrew grammarians in the first part of his Prolegomeni, Shadal catches an interesting absurdity in Masclef's system. Since none of the Hebrew letters--except for one--employ the חולם, and he used ו for u, his Hebrew lacks the o. Absurd enough for Semitic languages (for Masclef extended his method to reading Aramaic and Syriac), but he also renamed the letter קוֹף kuph. (I imagine Shadal would be very annoyed if he by chance sat in on our yingelach being taught the Aleph-Beis; then again, this applies to the names we use for half the letters anyway). In any case, Shadal continues to point out the absurdities, such as that in Masclef's method the Aramaic word for buying, זְבַן, and selling, זַבֵּן, must be identical! Finally, he conjectures that Masclef was influenced by the 1650 Arabic grammar by Antonio dell'Aquila who recommends beginners a similar method to reading Arabic without points, and to employ consistent vowels instead. However, writes Shadal, dell'Aquila modifies this rule with others which partly correct the imperfections causes by it, "concluding that everything must be subordinate to the use of the language," (Rubin trans., pg 50). Now I don't know if this notation is nearly as old as the book (printed in 1716, and appearing to have been owned by a "G. [or P.] Solier, L.H.B.") but it gives you an idea of the strong such a work was able to provoke. Why was Volozhin the first modern yeshiva again? A little fuel for Brisker pride. Volozhin is described as the first modern yeshiva in part because prior to its establishment yeshivos were mostly local affairs. When I find the third I'll update the post. Maharalgrzskl45; the Maharal confusingly divided into two people in an 18th century encyclopedia. I came across this funny, confusing reference to the Maharal in "The modern part of an universal history from the earliest account of time," an amazing 44 volume 18th century historical encyclopedia. The section is called "History of the Dispersion of the Jews." Liwa Bitzleer is obviously the same as Jehudah Betzaleel, or Leo Pragensis, who is known to Jews today as the Maharal (as an aside, does anyone know when and how the name Löwe lost its vav (or beth rafeh) quality and turned into Leib with a בּ ?). I think what happened was the author of this account relied on different sources and didn't realize he was reading about the same person. The first paragraph cites Basnage. I haven't yet looked it up in the original, but I guess Liwa Bitzleer comes from it. Gans' Tzemach David is cited extensively as a source, so that's probably where the second paragraph comes from. You can read Maharal's The Redemption and Eternity of Israel here. A 17th century Baptist godol sends funds to support the poor and distressed Jews of Jerusalem. Here's an interesting account of a Christian, Henry Jessey, donating funds to the Jews of Jerusalem in the mid-17th century. As you can see, the occasion was the aftermath of the decimation of Polish Jewry following the war between Poland and Sweden (only a few years after the Chmelnitsky massacres which arenot mentioned here, but probably the first cause for the situation of Polish Jews described here). This in turn dried up the donations Jerusalem Jewry relied upon, causing extreme suffering over there. Jessey's donation of 300 pounds was no small sum in 1657. Doing some currency conversions I came up with a sum of over $60,000 in today's purchasing power, which was probably quite helpful to people who were literally starving. However, I'm thinking the sum of "15 million rixdollars" which European Jewry was said to send in support of Jerusalem's Jews "annually" is just a bit exaggerated. The last two paragraphs are especially great, because in it he is described more or less as a contemporary godol or Chassidic rebbe, receiving visitors of all sorts, some to seek aid, and others even to engage him in learning ("some to consult him as a casuist"), yet he still had time left for his own hasmada. From The history of the English Baptists Vol. 1 1738, by Thomas Crosby. Read the rest here. For more on Hannah Snell. We'll leave the halachic parameters of כלי גבר to other bloggers. 1 Not having seen the Vetus Testamentum Hebraicum (yet) I was able to glean this bit of information about how the Aleppo Codex is called from William McKanes 1977 article "Benjamin Kennicott: an Eighteenth-Century Researcher," in the Journal of Theological Studies. Clearing up a 50 year old Herman Wouk mystery, or, how Christian Hebraists knew what rabbinic abbreviations mean. Danby, Moore and Herford were three philo-semitic Christian Hebraists who were active from the late 19th century (Moore and Herford) until the mid-20th (Herford died in 1950 and Danby in 1953). All three were responsible in their own way for respectfully introducing and promoting the study of rabbinic Judaism to a larger audience, whether by means of translating rabbinic texts, or writing popular books or article. This was indeed a departure, for before scholars of their kind the study of Judaism was generally subsumed under the wider heading of Bible, which obviously included Christian studies and basically excluded rabbinic Judaism, ie, anything happening in Judaism in the past 2000 years. This meant, in effect, that Biblical Judaism was studied and interpreted as part of Christian studies, appropriate to be sure, for Christian studies. But it lacked its own identity. As for rabbinic Judaism, its study took place under the umbrella of Semitic or Oriental studies generally, which is sort of a way of labeling it miscellaneous. In any case, what was a mystery to Wouk, how these guy's mastered rabbinic abbreviations without having a grandfather like he did, really isn't that much of a mystery. While it's true that many a Christian Hebraist had a go-to rabbi or talmid chochom for help, there are actually a number of tools which were available to the scholar who never built his chops in the beis midrash. For example, the pioneering work in the field (which even has its own name, Abbreviature) is Buxtorf's De abbreviaturis hebraicis (here you can see editions from 1613, 1696 and 1708). This very famous work was twice expanded, once by Tychsen (who has "semicha," see here) in 1768, and then by Gottfried Selig in 1780 (Compendia vocum Hebraico-rabbinicarum). Here's another supplement to Buxtorf. I think Wolff's Bibliotheca Hebraea lists many of them, although they're probably lifted from Buxtorf. These books were all very much available to Moore, Herford and Danby). There is Stern's ראשי תיבות of 1926, and there are many others. 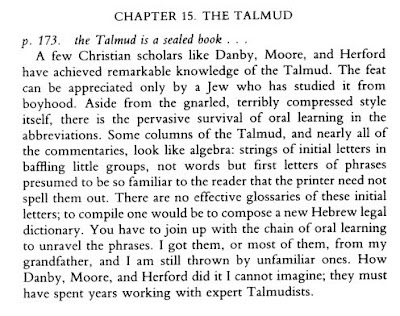 None of this is to take away from the accomplishments of Moore, Herford or Danby, but I'm not sure they must have spent years studying with expert Talmudists. In fact, I wouldn't be surprised if Herman Wouk's grandfather saw such a book or two, though not in Latin or English. See this English Hebraica post. Why are Rashi letters called Rashi letters?